The key difference between the 2 models is the number of upstream and downstream channels. 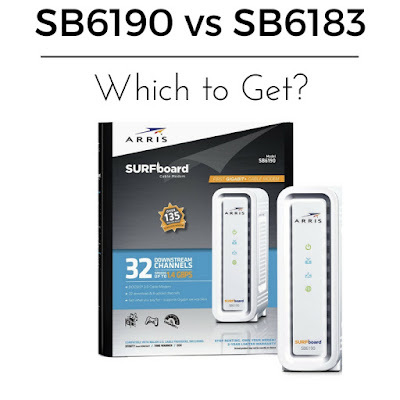 On the SB6190, you have 2x of both, which allows for a theoretical download and upload speed twice that of what you'd get with the older SB6183. With 32 download and 8 upload channels, the biggest benefit touted of getting the SB6190 is to "future-proof" your modem as your ISP enhances it's service in your area. Remember that the 1400 Mbps download speed is a theoretical maximum. If you upgraded to a 300 Mbps plan, you'll still be capped at the speed of your plan. Another reason to hold back on getting a SB6190 now is that it takes a few firmware updates, over a year or two, to shake out most of the bugs. There have been no major complaints for buyers on Amazon though, so that's a good sign at least. So, unless you're planning on getting a 1Gbps or faster connection within the next 2-3 years, it's probably better to stick with the SB6183 and save $30. DOCSIS 3.1 modems are starting to be certed and rolled out this year (2016), so in 2-3 years when the next speed revolution comes along (10 Gbps anyone? ), you could upgrade your modem to a DOCSIS 3.1 modem instead. Now in full disclosure, there are affiliate links in the article above and just wanted to take this opportunity to thank our readers for helping us to keep the site going. Your viewership and support means a lot to us. Thank you so much!